Beyond what the Wing Ding Dinner meant for individual candidates, the night put on display how excited and fired up Democrats are for 2016. That’s not always the case when your party is already in the White House. The sold-out, record crowd cheered loud and often for all the candidates, and the Surf Ballroom was a fun setting as always. Props to the organizers of the Wing Ding for putting together such a great event. 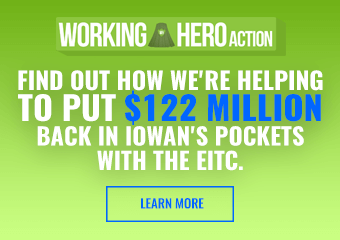 I expect many Iowa Democrats will be making annual drives to Clear Lake more and more now. Democratic enthusiasm aside, Hillary Clinton once again dominated a multi-candidate event with easily the best speech of the evening that brought all parts of the audience to their feet many times. Her performance at these events is actually quite a big deal, and not just because it’s a marked improvement over her 2007/2008 oratory. John Kerry and Barack Obama used standout speeches at the 2003 and 2007 Jefferson-Jackson Dinners to catapult their momentum in the last few months of Iowa campaigning, eventually scoring an upset win on caucus night. That appears to not be an option for Sanders and O’Malley this cycle if Clinton keeps this up. Right after the Wing Ding I had to prepare and attend the crazy State Fair day on Saturday, so this round-up and analysis won’t be as exhaustive as our Hall of Fame encyclopedia-long post. Pre-Rallies: Sign wars are a young person’s game. 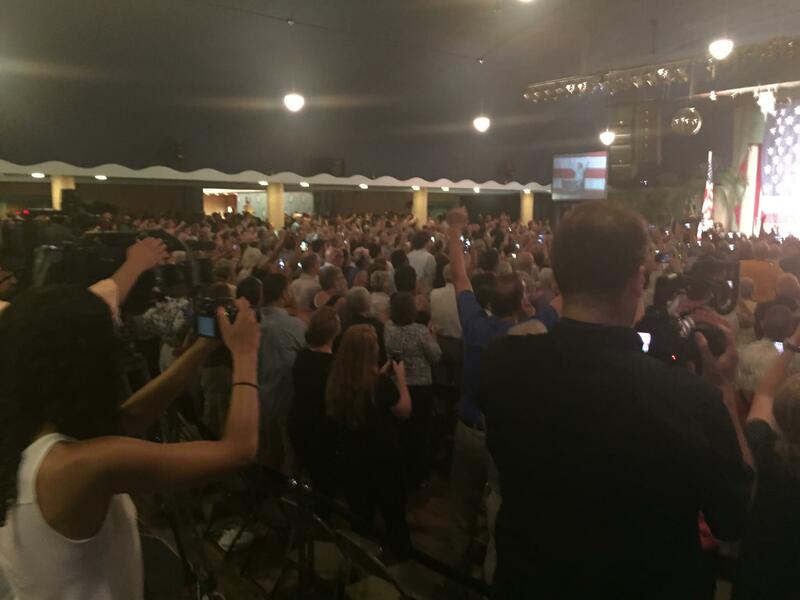 How the staff and volunteers for Hillary Clinton and Martin O’Malley chanted and cheered for three hours in the humid, 90+ degree sun-drenched weather before the dinner without melting is beyond me. 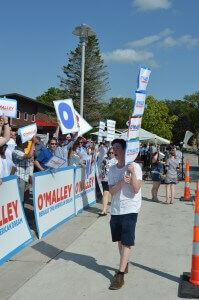 Both sides were well-represented, and O’Malley brought out the barn signs. The O’Malley presence is notable as always – he may be low in the polls, but O’Malley has a real, full Iowa Caucus operation ready to capitalize if he catches fire. My favorite part of the day was watching Will O’Malley, Martin’s 17-year-old son, lead chants for his dad over the bullhorn. Presidential campaigns are grueling things to work on, and you really need to have fun to keep the pace going. I can’t think of anything better for staff morale than seeing your candidate’s son run along a rally line, giving everyone high-fives. Iowa Speeches: Each Congressional and Senate candidate in attendance got a mere 2 or 3 minutes to talk, just enough time to project a little bit of their personality. I think 1st District candidate Gary Kroeger’s charismatic turn on stage was the best, and stuck around in my memory better than the rest. Rob Hogg laid out the reasons Democrats have a real shot of knocking off Chuck Grassley this year, pointing out Tom Vilsack’s and Paul Wellstone’s upset wins. 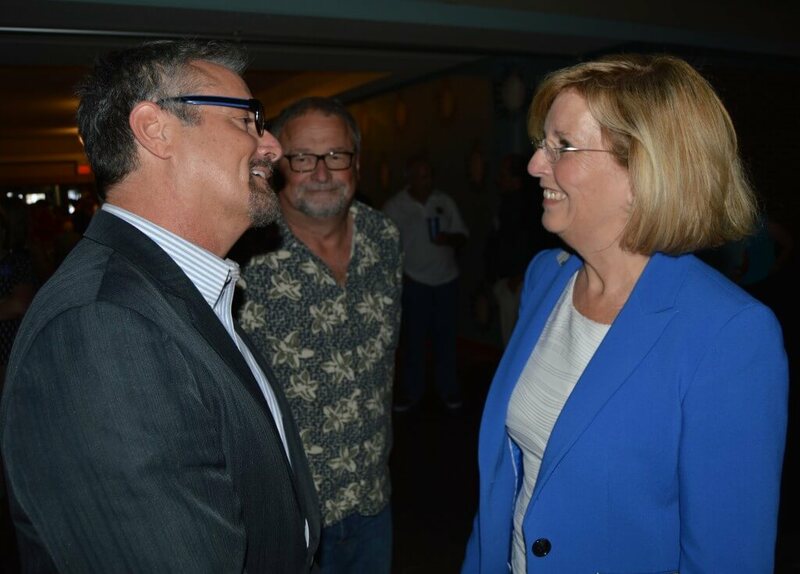 4th District Announcement: The big news of the night was party activist Kim Weaver’s declaration that she will run against Steve King in the 4th. She seems ready to hit the ground running with a full website already set up, a video message and some issues written out. Bleeding Heartland has some more on her background, and I also had this earlier post about her likelihood of running. I thought it was noteworthy from her speech that she’s running on some very liberal policy issues, a change from some of the past 4th District candidates. 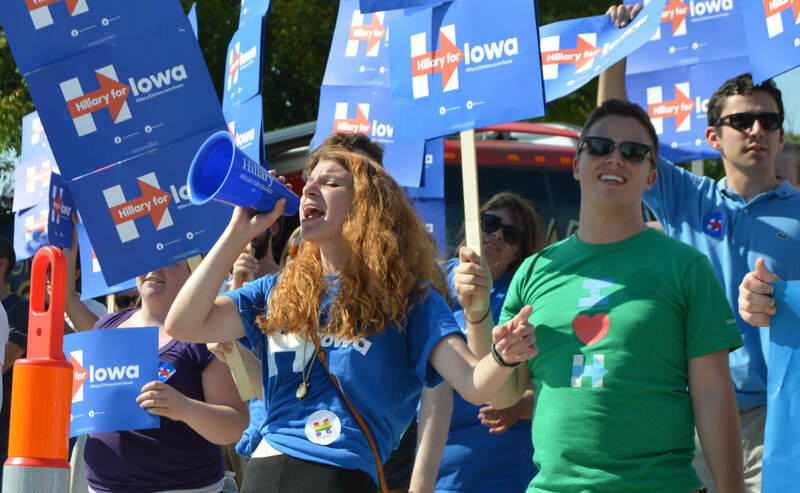 This was friendly turf for Clinton, having won many of the northern and western Iowa counties in 2008 that largely made up the Wing Ding audience. Still, she could have given this speech in front of a Bernie Sanders-only crowd and gotten a great reception. These speeches are quickly turning into one of her greatest strengths in the 2016 primary, and she hit another one out of the park with a forceful, enthusiastic speech. The first half of it was applause line after applause line delivered in a booming voice, with fun zingers coming non-stop. It was hard to keep up with all the great new lines, there were simply so many. The best section was an extended riff on the “gender card” topic, pushing back against Republicans who claimed she was using it for political advantage. Clinton was so revved up, in fact, that she blew her voice out halfway through her address. She coughed repeatedly for about a minute, and for a moment it was questionable if she’d be able to go on. However, her voice loss ended up being so well-timed – as it was right as she transitioned to the serious part of address – that Trey Gowdy could open an investigation into whether it was a conspiracy. Her voice now gravely and deep, she explained in an incredibly effective and new way about how the Citizens United case was originally about her – how an anti-Hillary movie set off the path to the court decision that allowed the dark money now being used to attack her. Perhaps most amazingly, the front-runner positioned herself as the scrappy underdog fighting off dirty attacks from the Republican machine. 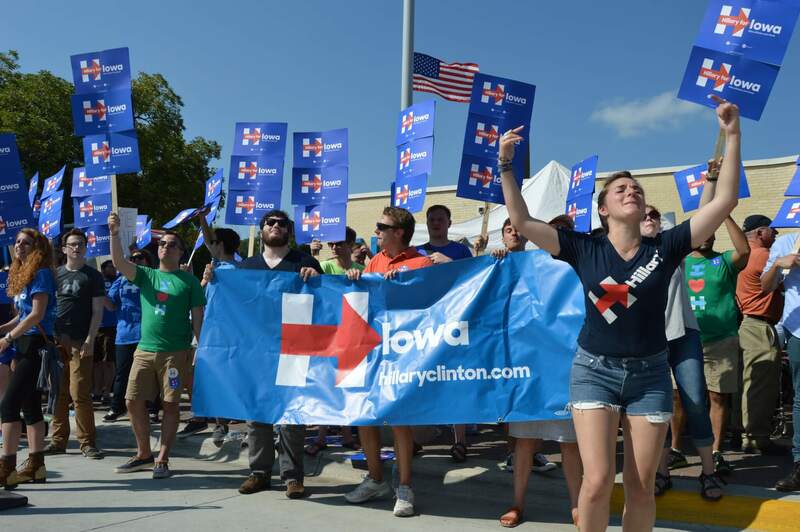 The email server issue was nothing more than the “same old partisan game,” she said. Critics will likely decry her Snapchat line as making a joke about transparency, but it went a long way toward girding Democrats against current and future criticisms they’ll have to defend her on if she’s the nominee. Sanders took the stage to loud and raucous applause, with most of his supporters apparently standing in the wings of the room. It was a typical Sanders stump speech, heavily focused on economic inequality and delivered with intense energy from start to finish. He didn’t seem at the top of his game that night, but still brought the Democrats in the room to their feet several times. 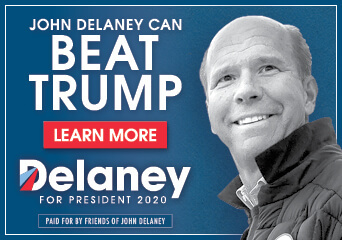 The outsider candidate has demonstrated time and again that he’s playing by his own rules in this primary, but you can’t help but wonder if he’s missing some opportunities. He shouted his entire speech into the microphone, which works well at his own events with his supporters’ energy, but less well here. He got strong applause throughout, but not nearly the same reaction Clinton received. And, as usual, he focused his entire address on policy minutia, which his backers will describe as a virtue, but sometimes voters want to know a little more about their future president personally. O’Malley does this well, and even though everyone knows Clinton’s story, even she effectively weaves in the story of her mother’s rough upbringing to provide some personal background. Sanders’ campaign refusal to play the sign war game is understandable (I mean, who really does that convince? ), but that too misses a chance to show off your momentum at multi-candidate events where all the press is at. If they wanted to, the Sanders campaign could completely swarm these things. 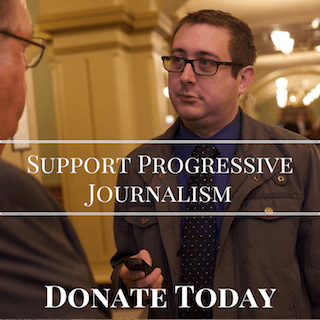 Sanders is doing an incredible job on the campaign trail even without following some of the usual caucus rules and traditions – but why not cover your bases just to be safe? As with Sanders, and unlike Clinton who unveiled many new lines, O’Malley stuck with his main stump speech for most of the night. Of course, he’s still in introductory stage for many Iowans. Still, despite coming off one of his best performances I’ve seen at the State Fair Soapbox the day before, O’Malley, also like Sanders, didn’t turn in one of his better outings. I’m also starting to doubt how effective the “sensible re-balancing” line (seems too technocratic) and the “I voted for you” call-and-response is after hearing it many times. All that being said, once again, O’Malley introduced himself to a large number of Democratic caucus-goers who hadn’t seen him before and got a great reception. That’s incredibly helpful to the little-known former Maryland Governor, and should help him continue to inch up in the Iowa polls. 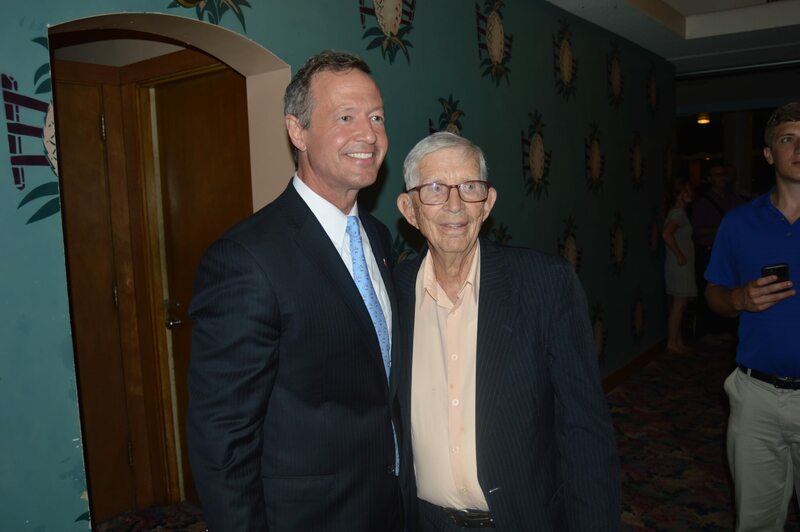 And maybe most significantly, O’Malley stayed around well into the night, shaking every hand he could find until the Surf Ballroom completely cleared out. That, obviously, is the way to do Iowa right. This was the greatest Lincoln Chafee speech I’ve ever seen him give. Of course, it still wasn’t good, but in relative terms, it was a definite improvement over past performances. That’s always a key thing to watch with any candidate – do they get much better over time on the campaign trail? Chafee seems to be a little better prepared now, though he still isn’t picking up any votes. Also, oddly, for a candidate whose reason for getting in the race was once assumed to be to hold Clinton accountable for her 2002 Iraq vote, Chafee sure did say a lot of nice things about Clinton’s foreign policy stands from stage.